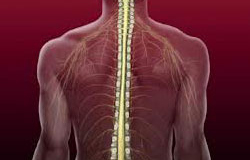 Spinal cord is a part of the body, along with the brain, related to the central nervous system. The spinal cord‘s primarily function is to transmit neural signals between the brain and the rest of the body. The spinal cord transmits the information between the brain and peripheral nervous system. The nerves within the spinal cord carry information from the body upwards to the brain and from the brain downwards to the body. The spinal cord can be damaged by a combination of fractures of the vertebral bodies with sprains, fractures of their arcs with spikes, ruptured discs, spinal ligaments, etc. Such damage can occur as a result of Motor Vehicle Accidents or Slip & Fall Accidents. The higher is the level of the Spinal Cord Injury, the greater is its impact on the motor functions of the body. Spinal Cord Injury may cause a loss of mobility or feeling of the body. Damage to the spinal cord requires long, serious and complicated treatment, and long-term rehabilitation. If a Spinal Cord Injury has happened to you, your relatives, or your friends, urgently call SLOMYANSKI LAW at 416-519-1006, or send a fax to 647-340-2899, or complete the form on our website in order to get a free consultation. You pay only after you receive compensation.